We are excited to share a preview for the upcoming release of our newest compact laser thickness gauge, the AGT600. This newest addition to the A.G.T. product family is designed to provide fast and reliable real time thickness measurement for the monitoring and control of material processing lines such as rolling and temper mills. 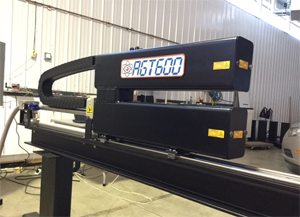 The AGT600 will have a very small footprint, making it a perfect fit for applications where space is limited. Simplified hardware and rugged construction allow the AGT600 to be extremely reliable and eliminates the need for peripheral accessories. It will use the same class of Keyence laser sensors as our patented AGT800 and measure any material processed in coil, sheet or strip form up to 0.250” (6.4mm) in thickness. Current plans call for The AGT600 to be introduced later this spring. Stay tuned for additional updates. Having spare gauge parts on hand can minimize down time when hardware fails. We offer a variety of packages for each of our gauges, ranging from basic essentials to complete parts kits. Contact us for details. A.G.T takes pride in understanding our customer’s needs and providing you with the best service and technical support available. We know the steel market has been down and a lot of our customers are hurting. To help, we are holding all 2015 labor rates, even though our own costs have increased. We appreciate our customers and look forward to serving you through these difficult market conditions. Our TCP/IP HMI interface enables your AGT400 or AGT800 to accept a single TCP/IP streaming socket connection on a user defined port for the purpose of requesting information from the gauge or commanding certain actions over an ethernet network. The gauge software will respond to a specific set of text commands by either performing the requested command or providing the requested information. Current commands allow for the control of the C-frame, measuring and reporting functions as well as the ability to provide thickness, deviation, coil length, coil diameter, C-frame position and digital input status information. Any client capable of sending and receiving text commands over a TCP/IP socket connection should be able to interface with our gauge software. The software will provide information in a text stream which can then be parsed to collect information in whatever way the client wishes to manipulate the data. Contact us for more information. If you connect an AGT400/AGT800 gauge to your network and allow access to the internet, an A.G.T. technician can remotely connect to your system and diagnose or repair many common computer software or hardware related issues. Ask us for details.